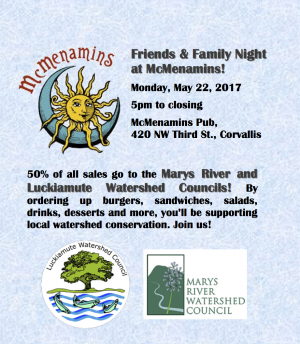 Family & Friends night at McMenamins is your chance to enjoy dinner out and support two local watershed groups! When and where: Monday, May 22nd, McMenamins, 3rd & Harrison, Corvallis, 5pm to close. Bring your favorite people out on a Monday night for food, beverage and support your favorite watershed council, too. Thanks for joining MRWC.